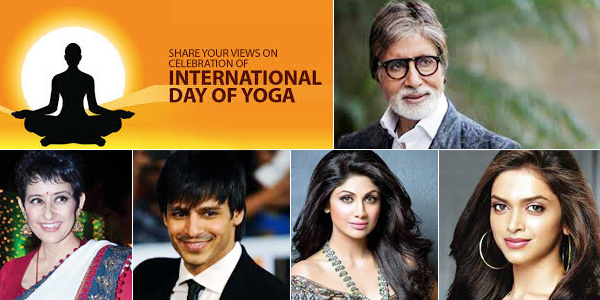 Applauding the brilliant idea of giving Yoga an international reach the Mumbai film industry popularly known as Bollywood has come out in full support of the International Yoga Day being held on June 21. Interestingly Bollywood actress Manisha Koirala, who got a new lease of life after she took to yoga and conquered the deadly cancer, has decided not to just be part of June 21 International Yoga Day but take the message of yoga in schools across Maharashtra. She will be part of a 24-member panel that will recommend how schools will observe ‘Yoga Mahotsav of Yoga Day’ and will advocate how to sketch out the syllabus to include Yoga festival in School Education and Sports Department. Deepika Padukone too applauded the government’s initiative but said, “ It is commendable to have International Yoga Day but it should not be restricted to mere one day affair instead it must be incorporating exercise into one's daily lifestyle. Shilpa Shetty, who is into preaching yoga as she has released few video tutorials on Yoga, will be celebrating the celebrating the International Yoga Day in Bengaluru. The event will see a marathon organized from Cubbon Park to Kanteerava Stadium, which will be attended by the Karnataka Chief Minister Siddaramaiah and his cabinet colleagues. Rare Moments when Bollywood Titans came together!